Great poker players are great sports. Wish your partners good luck as well as yourself. 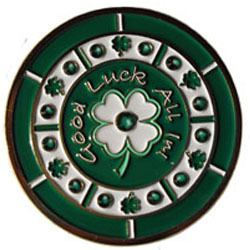 This Good Luck All In poker spinner has 13 emerald colored Czechoslovakian crystals, and it is made of stamped bronze and emerald green and white enamel, is 45 mm in diameter, 2.5 mm thick, and includes a plastic case to maintain its mint condition. This spinner can be yours now for just $14.00!